Drivers purchasing a new vehicle should be concerned with how the car has performed on all crash tests, as well as with the safety ratings the vehicle received. A good vehicle rating signifying a car has effective safety features can result in a significantly greater chance of surviving a car accident. An experienced T-Bone accident attorney knows drivers in side impact collisions are especially likely to experience permanent injuries or to lose their lives in a crash, as compared with drivers in other common collisions. Side impact crashes can be among the most serious because a car striking a vehicle intrudes upon the passenger compartment. The side of a car cannot prevent a striking vehicle from entering the passenger space, and it cannot absorb much force or momentum. While it is up to drivers to exercise reasonable care not to cause T-Bone accidents, you can’t help it if your car is hit when you are traveling lawfully through an intersection. By buying a car with positive performance on crash tests, you reduce the chances you or your family members will be permanently impaired or killed if a careless driver happens to t-bone you. Since 2003, Insurance Institute for Highway Safety (IIHS) has been performing side-impact collision tests. 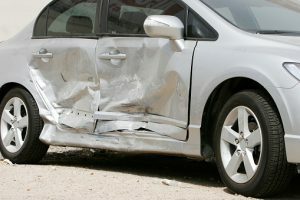 Side-impact accidents are often called “T-Bone” accidents because the striking car hits at a perpendicular angle and forms a “T” with the car being hit. IIHS used a barrier with the weight and force of a typical SUV or pickup to mimic the striking vehicle. There were crash test dummies, including dummies sized for men, women, and children, inside of the vehicle being hit. Only vehicles with head and torso protection are tested by IIHS, and testing is also restricted to vehicles with side airbags installed. How far the striking vehicle or barrier was able to intrude into the compartment where passengers sit in the vehicle being hit. The extent of “injuries” crash test dummies sustained to the head, neck, torso, pelvis, and legs. Once the test had been performed and injury risk measured, IIHS assigned each vehicle a rating of good, acceptable, marginal, or poor. If your car has received a “good” rating from IIHS, you are 70 percent less likely to die if you are driving a car involved in a T-Bone accident where it is hit from the left side. If your vehicle has received an “acceptable,” rating, you are 64 percent more likely to survive when your car is struck from the side as you are in the driver’s seat. T-Bone accidents should be prevented by drivers who pay attention, avoid running traffic signals, yield when required, and otherwise exercise reasonable care. Since drivers are always going to make foolish mistakes, be sure to look for a vehicle with a good IIHS crash test rating if you want to reduce chances of serious injury.